APPLETON, Wis. — 30-year-old Elyse Lucas is a teacher at Appleton North High School and Fox Cities Leadership Academy. She was diagnosed with breast cancer two months ago. When her students learned she was losing her hair due to chemotherapy, they came up with a plan to show their support. Eleven of her students made the bold decision to go fully or partially bald. "It was freeing, but it was also a little scary," said senior Hailey Johnson. "They're all like freaking out, just like mouths, jaws dropped," added senior Amry Gilkey. The buzz cuts were all captured in action on video at Peaceful Purpose which is a non-profit salon that provides free or low-cost haircuts, wigs and head coverings for those dealing with illness. The teens even had pink ribbons shaved into their heads. "I feel like it shows awareness," said Gilkey. They also wanted it to show support for their teacher who shaved her head the same weekend. When Lucas returned to school on that Tuesday, she was wearing a wig for the first time. "I walked into the building really kind of head down just trying not to draw attention to myself, and just a little self-conscious just being this is a new look, people are going to talk," explained Lucas. 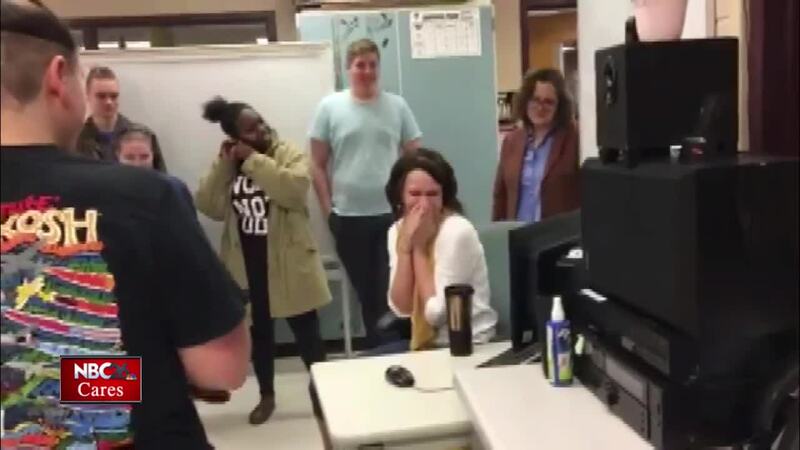 A student surprised her, though, by playing the video of the teens chopping off their locks. He captured her emotional reaction as she watched the monitor, and her insecurities began to disappear. Lucas said, "When I saw the video, I think honestly all those negative connotations, all those negative thoughts just went out the window and I felt empowered, and I felt like I could embrace my new normal." She even got the courage to take off her wig to pose for a photo with her students. "She's helped us with everything in high school, like helped us all plan our futures. We've been with her for four years, so when this actually happened to her, we finally realized we wanted to do something in some way to give back for all that she's done for us," explained senior Autumn Teal. The students' kind gesture did more than help Lucas' confidence, it also benefited the organization Wigs for Kids . "We donated 91 total inches of hair which is absolutely crazy," chuckled Gilkey. "Students are incredibly caring and amazing individuals," said Lucas. "Yes they're young, but they have a heart and they're amazing." Every time Lucas sees her students' shaved heads, it helps fuel her through the fight ahead. "It's just like a little glimmer of hope for each day." The head shaving video has more than 11,000 views on Facebook. Lucas and her students hope it not only inspires others to help a friend in need, but that it will also raise awareness of early onset breast cancer . Lucas expects to undergo eight months of treatment including chemotherapy, radiation and surgery, all while teaching and going to school for her master's degree. The students believe her upbeat and optimistic attitude will help her beat the disease.